Families, friends, coworkers, teammates, church-goers, and coworkers — welcome to Cadillac Creek in the Great Smoky Mountains! 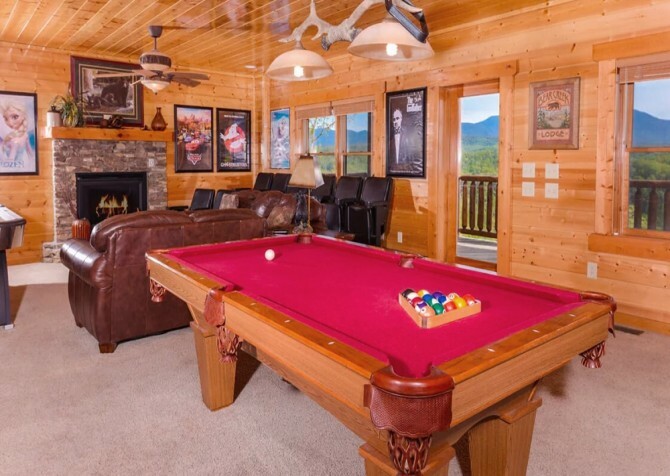 Set in the serene Cedar Falls cabin community, this 4,000+ square-foot lodge is a beautifully decorated 5-bedroom, 4-bathroom Pigeon Forge cabin for 22 with a Food Network-sized kitchen! As you step inside, high, vaulted ceilings offer a dramatic feel at this “Cadillac” of cabins. All throughout, brand-new bedding and memory foam mattresses, furnishings, décor, handmade beds, small appliances, dishes, and flatscreen TVs give you the ultimate in luxurious Smoky Mountain retreats. Spend days hanging out and relaxing in the awesome private backyard, where you’ll find a built-in wood firepit area, peaceful pond, and soothing waterfall that offers calm water sounds year-round. On the screened-in porch, sit back in the patio seating for 6 and flip on the TV with cable! In the Cedar Falls community, let the kids play at the playground, splash around in the outdoor pool in summer, cast a line in the catch-and-release fishing pond, attend Sunday services at the chapel, or enjoy walking trails by the stream. Inside, the amazing 50s-themed game room and theater room will impress both kids and adults. Have a snack and drink in the diner booth, set the fun game-time mood with the Bluetooth jukebox, play air hockey and ping pong, show off your skills on the arcade game, or relax in the 15 leather reclining theater seats! 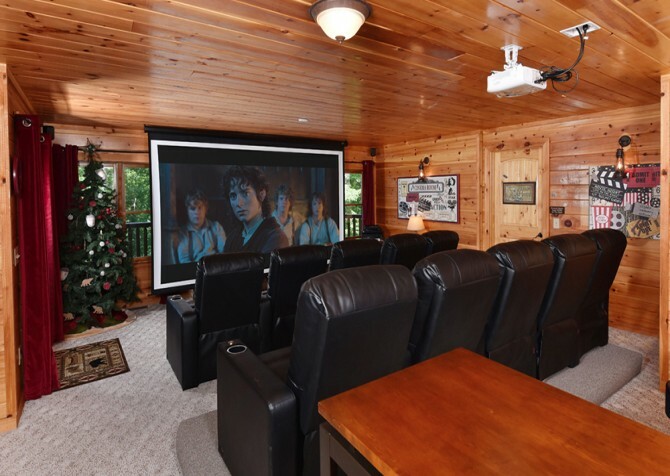 The 150-inch movie-theater-style screen with projector and movie library with DVD player is the ultimate movie-night spot. The best of the best all around, Cadillac Creek also boasts seasonal mountain views, an inviting gas fireplace, king-sized beds, TVs in the bedrooms, rocking chairs, a convenient washer and dryer, high-speed wireless internet, and easy parking with a circular drive. 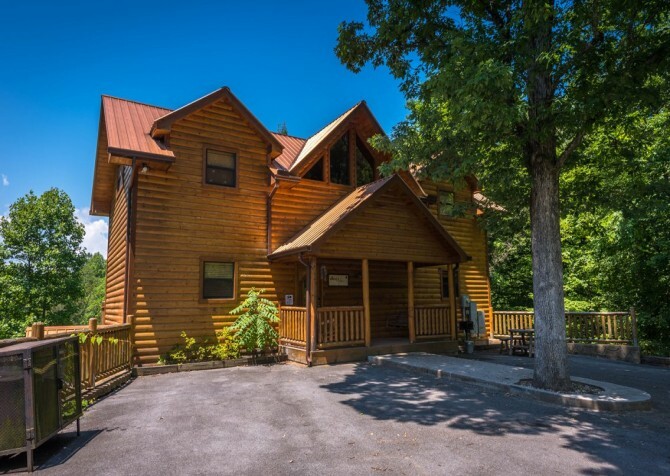 From family reunions to church retreats to team getaways and more, this large-group cabin is more than ready to host your memorable Smoky Mountain stay! Begin by exploring the open-concept living area, featuring vaulted ceilings with exposed log beams, modern woodsy décor, a large chandelier, and hardwood flooring. The large windows pull the tranquil wooded views indoors, while the stacked-stone gas fireplace creates that cozy cabin feel. Plop on the leather sofas for a rest after your travels with a comedy show on the big screen TV or set out a provided board game on the coffee table to kick off your fun vacation — classics like Scrabble, Candy Land, Pictionary, Clue, Trouble, and Monopoly will keep everyone entertained! On cool evenings, get a toasty fire going and whip up a batch of rich cocoa for the gang. And when you’re ready for the next chapter in your latest read, switch on the adorable floor lamp depicting 3 bear cubs climbing to a honey treat — how sweet! Looking for a Food Network-sized, fully equipped kitchen? Cadillac Creek has you covered — gorgeous granite countertops, a commercial-style refrigerator, stainless-steel appliances and double sink, granite flooring, and tons of counter and cabinet space make this kitchen a chef’s dream! Create one-of-a-kind meals, perfect Grandma’s secret recipe, bake tons of cookies, store loads of drinks and snacks, blend morning smoothies, brew pots or K-cups of joe, steep herbal teas, pop movie-night must-haves, and let the dishwasher take care of the mess! There’s also a breakfast bar, perfect for serving up a lunch spread, chatting with the cook, letting the kids lend a helping hand, or being an official taste tester (our favorite role in the kitchen). With so many delectable dishes, luscious leftovers, and midnight munchies, the dining area will quickly become a central place for your group. Harboring 2 large log-style tables with bench seating and chandeliers overhead plus an expansive wet bar with additional stools, the dining area provides plenty of room for 22. The stained-glass window and mountain-themed artwork really elevate the space, and the kids will get quite a kick out of the swinging black bear above. Be they meals, board games, emails, discussions, cocktails, or arts and crafts, the dining area will certainly come in handy on your trip to the Smokies! Okay, you’ve relaxed in the living area, cooked in the kitchen, and dined in style. Now, it’s time to let loose and party in the 50s-themed, checker-floored rec space — starring fun games, a Bluetooth jukebox, and a private home theater! Challenge friends to a card game at the diner booth, toss back a couple of cold ones at the pub table for 4, show off your pro ping-pong skills, beat the highest arcade scores, and become master of the air hockey rink. When you’re ready to mashed potato and do the twist, roll the ping-pong table away and hit the dance floor, with jukebox tunes and killer moves! Ready to slow things down with a riveting drama or ramp them up with an action flick? Recline in the 15 leather theater seats, select a feature film from the movie library, pop in the DVD or Blu-ray disc, and start the show on the 150-inch theater-style projector screen! Add bountiful bowls of buttery popcorn, chocolate candy bars, and root beer and soda pop, and you’ll be all set for a top-notch movie experience at Cadillac Creek! 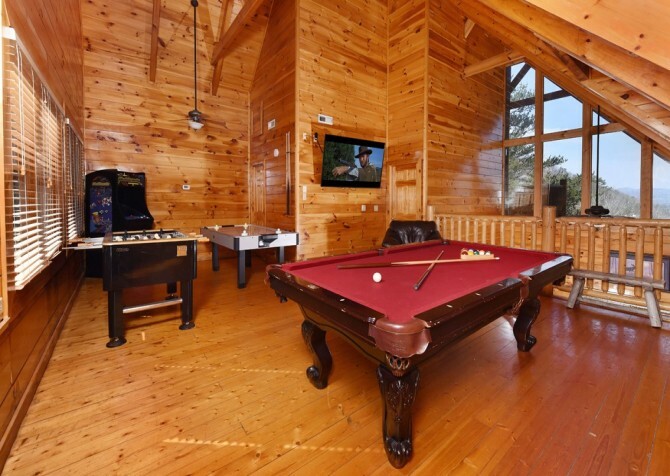 After a full day exploring Pigeon Forge and playing at Cadillac Creek, you’ll truly appreciate the 5 bedrooms with cozy furnishings, custom-made beds, memory foam mattresses (all except one), flatscreen TVs, and genuine cabin charm. For additional sleeping arrangements, the living room’s queen sleeper, also with a memory foam mattress, is a great option. On the entry level, the spacious master suite awaits with an en-suite bathroom — featuring double sinks, a large walk-in shower, and an indoor jetted tub — in addition to the Aspen log canopy bed, king-sized for absolute comfort. Adjacent to the room, through the French doors, lies the kids’ room with a log cabin design, White Cedar twin bunk bed (extra-large), and a media space for entertainment. The second bedroom on this floor boasts a beautiful wooden rocking chair that compliments the Northern White Cedar full-sized bunk, hand-carved with intricate black bear detailing. And there’s a full bathroom with shower just down the hall. 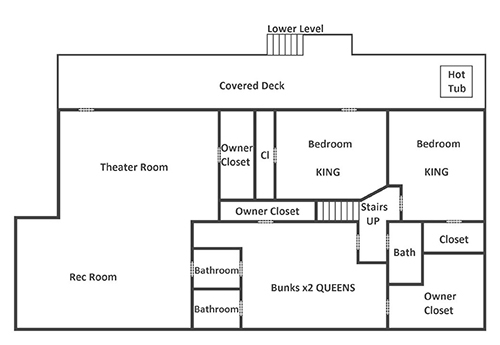 On the lower level, you’ll find another full bath with a shower and tub combination plus 2 king bedrooms. One harbors a heavy Aspen log bed with charming bear art on the headboard, while the other offers not only a Northern White Cedar log bed with carved black bears for posts but also direct deck access, keeping secret hot tub soaks close at hand! And the kids and kids at heart will adore the queen-sized bunk beds in the last bedroom as they were handmade to resemble cabins — what else! — with windows, rooves, and even chimneys! There’s also another full bath with a private shower room, separated for extra convenience. Reconnect with nature at Cadillac Creek, featuring a variety of outdoor spaces sure to suit everyone in your party. After traveling easy roads to the private, motorcycle-friendly lodge, pull into the flat, paved, circular driveway with parking for 3; there is additional parking space in the long driveway. Grab your suitcases and head only a few steps into the Smoky Mountain home, where you’ll soon discover multiple decks with extras plus a fenced backyard with a built-in wood firepit area and a lovely pond with a serene waterfall year-round. Venture to the entry-level deck for tree-studded views and barbecue fresh off the gas grill or head to the lower-level deck for muscle-soothing soaks in the bubbly hot tub. Either deck you choose, the rocking chairs are sure to please and pair well with morning coffee, afternoon tea, and evening chats in the Smokies. In cooler months, enjoy seasonal mountain views and ghost stories by the mood-setting firepit. 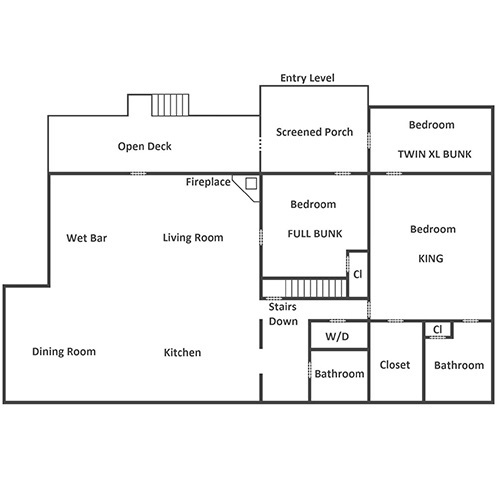 There’s also a screened-in porch with a ceiling fan, patio seating for 6, and a mounted flatscreen TV with cable! Prepare for Cadillac Creek bonuses — including a washer and dryer, high-speed wireless internet, and community perks through Cedar Falls Resort! Walk along peaceful trails by a stream, catch (and release) a big one at the fishing pond, take the little ones to the playground, attend Sunday services at the chapel, and swim all summer at the seasonal pool. Less than 7 miles to downtown Pigeon Forge, Cadillac Creek keeps you close to nature without sacrificing distance from city restaurants, local attractions, and alluring shops! Hop on the Coaster at Goats on the Roof, where the views are spectacular, the ride is thrilling, and there are actually live goats on the roof! Gather your archaeological wits, head into the ancient Egyptian tomb, and escape in 45 minutes…or incur the Pharaoh’s fury! Shop, play, and eat all day at The Island in Pigeon Forge, featuring The Great Smoky Mountain Wheel, fun games, over 35 stores, and mouth-watering restaurants.